There’s a new Addams Family in town. A new animation based on the classic characters created by Charles Addams will hit theatres this October. It will feature the voices of Oscar Isaac, Charlize Theron, Chloë Grace Moretz, Finn Wolfhard, Nick Kroll, Bette Midler, and Allison Janney. Check out the first teaser trailer below. 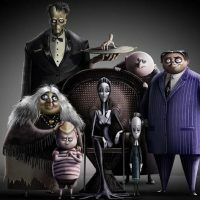 As much as I would love to see more original ideas hit theatres, I am a BIG Addams Family fan!